What could the distribution indicated by the blue squares possibly be? Not volcanic domes or rilles because the squares aren't in the maria. The squares show the distribution of something much less obvious, but more fundamental: nearly pure anorthosite. These are aluminum-rich rocks that formed at the end of the Moon's accretion, when it melted, perhaps entirely, causing iron and other dense materials to sink, and low density elements, like aluminum, to rise buoyantly to the surface. This magma ocean was global and when it cooled the anorthosite scum became the Moon's bright highland crust. This widespread distribution was discovered by Japanese scientists analyzing Kaguya's spectral data that unambiguously detects nearly 100% pure anorthosite (PAN). The blue squares show that PAN rocks are nearly global within highland terrains on both the near and farsides. This is powerful support for the magma ocean hypothesis. There is probably more nearly pure anorthosite than shown for two reasons. First, the data used has a resolution of 500 m, so smaller deposits probably exist. Second, the development of regolith conceals the PAN spectral signature so PAN can only be identified in fresh material such as crater rays or surfaces exposed by downslope movement on central peaks, crater walls and basin rings. Ohtake and his colleagues note that on the nearside PAN is restricted to areas near basin rims. That could also be true for the farside, but the basins there are much less conspicuous; a careful comparison of PAN occurrence and basin rings needs to be conducted. 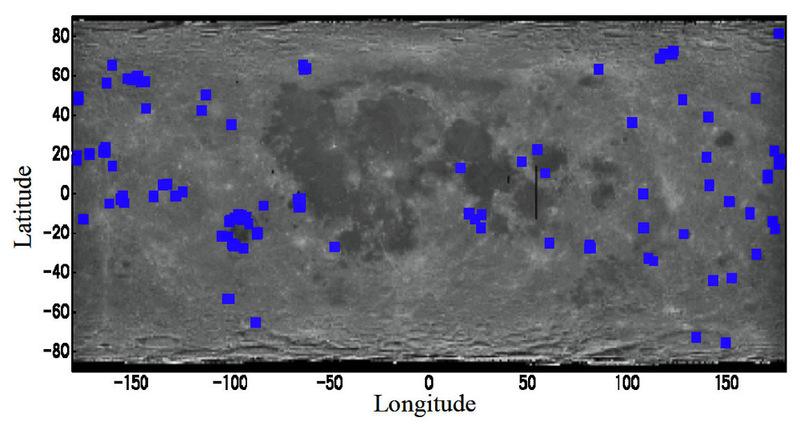 M. Ohtake and others (2010) Distribution of purest anorthosite on the entire lunar surface. 41st Lunar and Planetary Science Conference #1628. Korotev and others note the lack of PAN rocks in lunar meteorites and consider that the anorthosite layer may not be global. Tomorrow's LPOD: Too Small To Fail? This page was last modified on 19 April 2019, at 01:02.